At IDF 2015, Intel focuses on the computing experience, rather than its big name processor, like Skylake. CEO Brian Krzanich highlighted the computing experiences that's enabled by devices like Intel's RealSense 3D camera, the Intel Curie platform for Internet of Things and wearables. The computing experience is delivered based on three assumptions, Krzanich said during his keynote. These include sensification, smart and connected devices and experiences that are more personal and an extension of you. 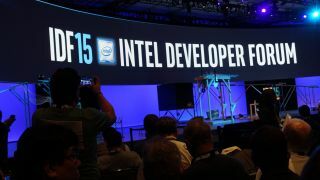 With sensification, Intel hopes that its developer partners will work to deliver a more immersive computing experience. Instead of being confined to a 2D world, that's often defined by a keyboard and mouse experience, sensification brings added dimensions to the computing experience with feedback. With Intel Smart Sound technology, for example, Intel adds extra capabilities into the Cortana digital assistant on Windows 10. There is an integrated digital signal processor that's always listening, and this allows you to use voice to wake up your PC from a power saving state. On stage, Krzanich's team showed that you can say "Hey Cortana, wake up" to command your PC to wake up your PC. It takes about five seconds for the PC to wake up from hibernation with just your voice command. With RealSense, Intel is expanding the use beyond just password authentication. Working with Google, Intel is bringing RealSense to smartphones like Project Tango. With RealSense on your phone, you can use the camera to create 3D scans and maps. RealSense is not only a great camera, Krzanich said, but it can also measure depth and positioning. As one example, Intel talked about a drone equipped with RealSense navigating through a forest of trees. Called the "Game of Drones," Krzanich said that RealSense, along with fast, real-time computing, helped the drone avoid crashing into trees. RealSense can also power the next generation of robotics. Working with Savioke, RealSense can be added to robot butlers, like the Relay. This way, robots can navigate around the physical world and avoid obstacles, preventing collisions with humans. To make RealSense smarter, Intel says you can add connectivity to bring real-time feedback. One example is a new smart mirror developed by Memoi that is available at high-end retailer Nieman Marcus. These mirrors can superimpose different color options on clothing, so you can try on a red jacket and see how a blue, black or purple jacket will look on you. When you're done trying it on, you can share the images and videos with friends so they can help you decide what's the best color and fit. For gamers, Razer is making a RealSense peripheral that can track where your eyes are looking in a game. In a demonstration of a racing game, when the player moves his focus, the view of the game also adjusts on the screen. Turn your head to the left, and the view of your race shifts to the left. This makes gaming more immersive, Krzanich said. A connected Nabi babyseat is another way that connectivity can make IoT more practical. If the Nabi babyseat buckle is connected, and you walk out of Bluetooth range of the seat, your phone will send you visual and audible alerts to warn you that your baby is still in the seat. Intel says that this will help prevent the deaths of forty or so babies that are left behind in car seats everywhere. Additionally, Intel is working with partners Microchip and Amtel to bring its Enhanced Privacy ID, or EPIC, security to IoT devices. EPIC brings silicon-level root of trust security to deliver secure, anonymous communications for IoT devices. A simple way to make computing personal is to expand into the wearables space. Intel partner Fossil Group showed off a collection of braccelets, smart watches and a connected watch with a digital display on stage. Fossil says that its watches will be available under its own brand as well as through partner brands, like Armani, Michael Kors and Tory Burch. For IoT devices, Intel showed off the capabilities of its Intel Curie processor, which is the brains behind gadgets that need to connect. For example, in extreme sports, like BMX biking, Curie can be embedded into the handle bars and car seats, and Intel says that additional sensors can even connect to Curie. Curie gives real-time data on the movement of the handles, rotation and how the bike's body moves. This data allows the athlete to train better and for the audience to understand how tricks and stunts are performed. Wearables can also make it more safe and easy for log into your computer. Similar to how Apple Pay requires you to authenticate once on the Apple Watch, a new Intel bracelet prototype allows you to quickly log into Windows 10 when you're within proximity of your PC. To keep things even more secure, once you take your bracelet off, you'll need to authenticate again with your password. This way, if someone steals your laptop and your wearable, they can't access your data. The technology integrates with Bluetooth Low Energy, uses Intel's ID IQ and integrates with TrueKey. To bring more devices to market, Intel partnered with famed reality television producer Mark Burnett to host a new competition called the America's Greatest Maker's challenge, with winners set to receive $1 million. The challenge, hopefully, will bring more personal and connected devices that helps bridge the digital and physical world.